February 10, 2014 /0 Comments/in Diabetes /by Jenn F.
About 22% of adults with diabetes are smokers, according to the American Heart Association. One of these smokers, recently diagnosed with diabetes, is Emma Drake who says, “There’s nothing better than having my morning cup of hot tea with a cigarette.” While she knew smoking was “bad” for her, she didn’t realize that her two-pack-a-day habit greatly increased her chances of developing diabetes. In 2007, Swiss researchers found that smokers have a 44% greater risk of developing type 2 diabetes compared to non-smokers. For one-pack-per-day smokers, the increased risk of diabetes rose to 61%. Since then, many more international studies and a new surgeon general report have confirmed the link. One of the big concerns we have about smoking is the problems it causes for the diabetic foot. Studies reveal big risks for smokers with diabetes. 1. Smoking dries the skin. Nicotine reduces blood and oxygen flow to the lower layer of your dermis, according to The Daily Mail, which causes cell production to diminish. The end result is dry, flaky skin that is “less resilient to external stresses.” As we’ve mentioned before, one of the ways bacteria and fungus gets into the body is through cracked heels caused by dry skin. 2. Smoking leads to diabetic neuropathy. Patients who smoke are almost twice as likely to suffer from diabetic neuropathy as non-smokers, says the Mayo Clinic. 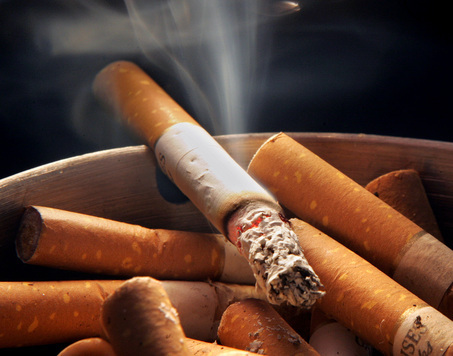 A recent study found that 62% of patients with diabetic neuropathy were smokers. “It is not clear exactly why smoking appears to increase the risk of diabetic neuropathy,” said study co-author Toby Weingarten, M.D. He added that doctors believe that smoking causes an ischemic injury that restricts blood flow and circulation to the extremities. 3. Smoking causes blood clots. – People who had smoked in the past had a 17% higher risk for developing deep vein blood clots compared to people who had never smoked. – Current smokers were 23% more likely to suffer a blood clot compared to people who never smoked. – For every additional 10 cigarettes smoked per day, the risk of a blood clot increased 10.2%. – A person who smokes one pack a day for 40 years has a 26.7% higher risk of developing a deep vein blood clot. – In a smaller review of 13 studies, when adjusted for BMI / obesity factors, smokers were still 30% more likely to suffer a blood clot. Smokers with diabetes suffer a number of adverse effects to a much greater degree than non-smokers. 4. Smoking increases your chances of developing an ulcer. The CDC reports that the overall prevalence of foot ulcers among diabetics who smoke was 15.8%, compared to 11.9% among former smokers and 10.3% among nonsmokers. Smoking constricts the blood vessels, which can lead to blood vessel disease, worsening foot ulcers and infections. 5. Smoking delays wound healing. Since smoking is known to decrease blood flow to the extremities, it also makes wounds slower to heal. One study found that cigarette smoke delays the formation of healing tissue and encourages scarring at the edge of a wound. Another study found that smokers who quit a month before surgery can halve their risk of post-surgical wound healing complications. Your body will start to experience regenerative changes within 20 minutes of quitting. The benefits of not smoking are important for everyone, but even more so for people dealing with diabetes and other diseases. If you know you are diabetic, it’s important to not start smoking or to quit if you are smoker. Every measure you take to protect your body is valuable and worth the effort. If you are committed to preventing diabetic foot infections, seek support to quit smoking today — and invest in a SteriShoe UV shoe sanitizer to limit your contact with dangerous foot pathogens! Could a Baking Ingredient Have Antifungal Properties? Woman Claims Cornmeal... Types of Onychomycosis: Which Do You Have?